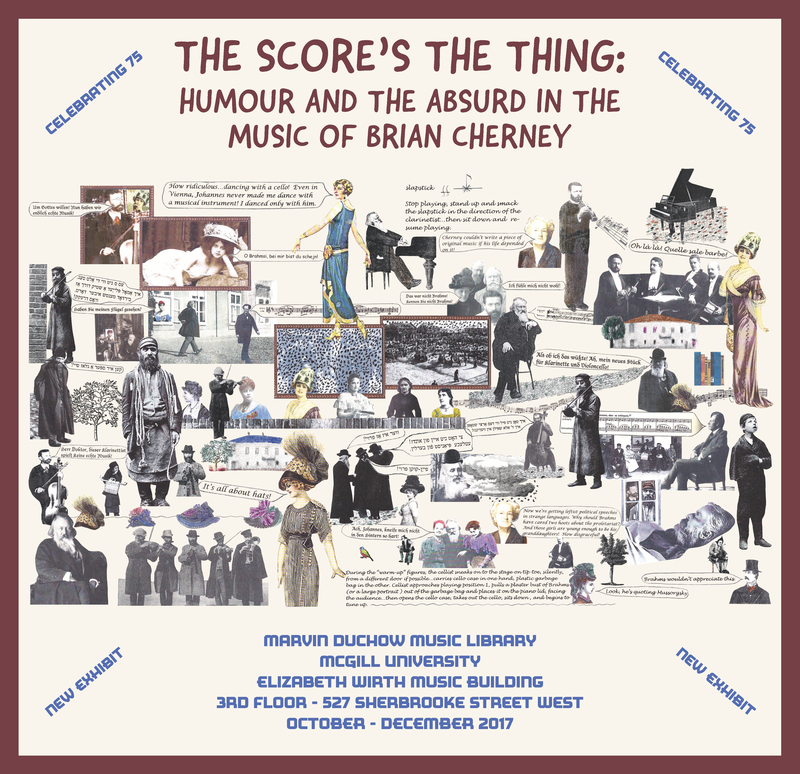 The Marvin Duchow Music Library’s latest exhibition entitled, The Score’s the Thing: Humour and the Absurd in the Music of Brian Cherney celebrates the Canadian composer Cherney’s recent 75th birthday and focuses on five theatrical pieces written over a thirty year span. Three of the first four works (Tangents I, Group Portrait with Piano and Playing for Time), composed between 1975 and 1981, explore and expand upon several integrated and overlapping themes. Cherney examines, in various humourous and improbable ways, the influence of nineteenth-century Romantic music on late twentieth century performers and composers who share a love for its beauty but also must bear the weight of its unshakable influence. He also critiques classical music performance traditions and pokes fun at the absurd relationships between live performers and seemingly inanimate musical instruments. The “irrational” and “ghostly” appearances of 19th century musical excerpts and the theatrical conjuring of the composers themselves reinforce expressions of anxiety and ambivalence. The fourth theatre piece from this period is born out of Cherney’s frustration with the lack of live and recorded performances of Canadian music. In Trois petites pièces, the second movement joins together snippets of traditional music notation with a collage of 19th and early 20th century lithographic images thereby creating a score that is according to the composer, “so visually interesting that it doesn’t need to be played.” Decades later, Cherney combines the fruits of these early theatrical and absurdist experiments in the 2009 piece entitled Brahms and the German Spirit. In this extended and complex work he expands his examination of 19th century German high-art music and culture and contrasts it with Jewish musical traditions and history, culminating in the powerful imagery of the Holocaust. 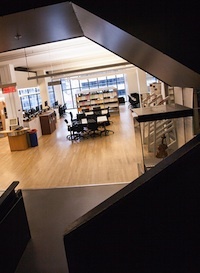 We hope you will take the time to look carefully at the scores and read the small essays or captions (English, French, Yiddish) accompanying each work in the display cases facing the elevators and on the third floor wall north of the Library front entrance. For your convenience, there are also two video performances of Brahms and the German Spirit located on iPads in front of the complete score. This entry was posted in blogs and tagged absurd in music, Augenmusik, Brian Cherney, Canadian music, humour in music, twentieth-century music by Cynthia Leive. Bookmark the permalink.